I have been big on these e-print printers ever since HP announced them last year. The thought of being able to send an email to an email address and it automatically print was a very neat concept. Plus the fact that it was wireless at my house made it even better. That way I wouldn’t have to have a desktop computer running all of the time in my house that was set to share the printer. Because that means that if the computer wasn’t on, then I couldn’t print from my laptop, and it is much more difficult to get setup and administer. This past Christmas I got one of the e-Print printers as a present and it took all of 20 minutes to setup and get configured the way I want. I got the HP Photosmart D110A Wireless e-All-in-One Printer and have loved it. At the time, I think it was about $50 around the holidays, where it’s now more like $70. But still it’s a great deal on a nice printer. So, other than the wireless printing and the email printing, which I used just this week to print an email from work on my home printer, what else does it do? Well, it copies and scans as well. Plus it has a memory card slot so you can print directly from the card. And it has apps. I know that apps is kind of a buzz word, but it really does have apps. 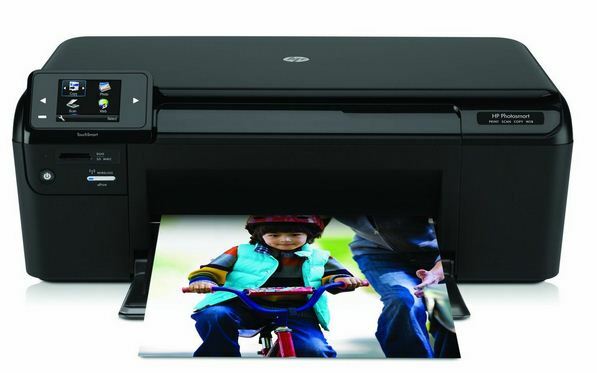 It has applications that you can install on the printer to make you print more. So, for example, I can flip through the apps and print a coloring page for Lyla from Disney without ever going to a computer. You just go to the apps on the touch screen and click on what you want to print and it prints. Sarah can also do the same thing with coupons from coupons.com. She is able to go to the printer and choose the coupons she wants to print and print them directly from the touchpad. It’s a smart ploy to get you to print more. I like it personally because it actually does make sense as you are going to have to be at the printer anyway to get the papers, so why not just do it all from there? Also, it is AirPrint capable, which means that you can print from your iPad or iPod touch or iPhone just by hitting print and it will find the printer on your network. Not only that, but yesterday, Google announced that all HP e-Print printers are also Google Cloud Print Capable. What that means is that from your Android device, or on any computer that you have Chrome installed with the ePrint option checked, you can print to your other printers. You simply go to the Cloud Print Start page and add the printer’s email address, and it adds it to the account that you are logged in as. So it added to my google account right then and I was able to see it as an option on both my Chrome browser and my Android phone. Very cool stuff. It won’t be long before we won’t have to have print servers anywhere. And especially at that low of a price. Now, there are higher priced models that contain things like tablets like the HP Photosmart eStation All-in-One, but really, for most people, the model that I have does everything that most people need. So, in my personal opinion, I think that your next printer definitely needs to be an HP e-Print printer to make sure that you are compatible with the wireless technology in the future.